The Lombard 6 classic fit pyjama set in navy features a geometric repeat pattern of our rose logo subtly woven into the silky soft fabric. Often mistaken for silk, our Lombard fabrics are a dream to sleep and lounge in throughout the year. The Lombard 6 has a subtle pattern allover featuring our signature rose logo. The intricate design is woven into the mid-weight fabric using a traditional jacquard technique to produce a layered and textured repeat pattern. With its satin sheen and touch, it feels as great as it looks. 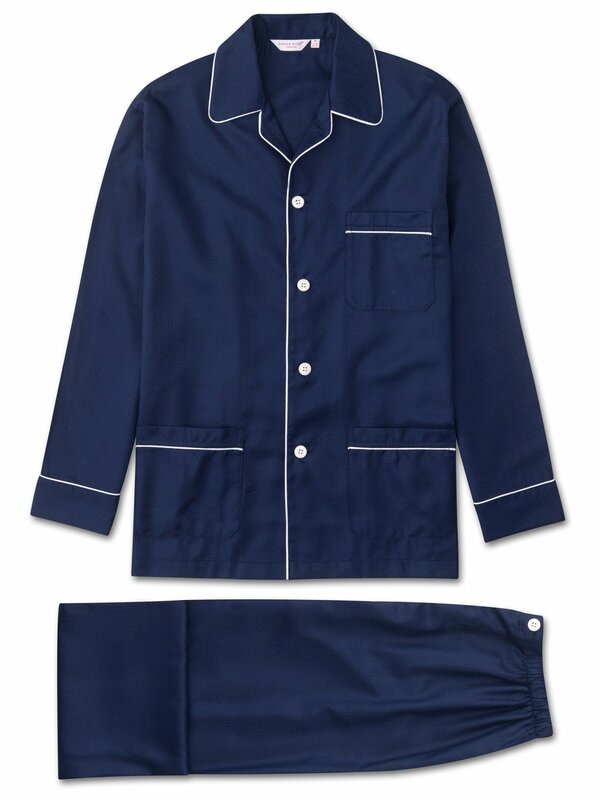 Featuring a three pocket jacket, classic collar and adjustable two button traditional fly, this classic fit PJ has a relaxed cut and elasticated sides on the trousers, meaning the front and back are flat for your comfort.